When it comes to the safety of your home or business, only the best will do. That’s why we rigorously test all of our products to meet the UL 325 standard, the industry’s highest safety requirements. Our trained authorized dealers make sure that you have the right equipment, installed properly, to always keep people and property protected. All of our garage door openers, commercial door operators and gate operators comply with the industry’s highest safety requirements, including the UL 325 standard. Our safety accessories are designed and tested to work together with our openers and operators, providing the highest level of safety. LiftMaster authorized dealers are trained to design and properly install our products, so you’ll always know your system works exactly how it should, every day. IS YOUR GARAGE REALLY AS SAFE AS IT SHOULD BE? 1 in 15 garages may lack the latest garage door safety features or may not be operating properly. Do our easy 3-Step Safety Check to ensure it is rock solid, and your family is protected. Need assistance? Contact a dealer today. 1. Check the sides of the garage door for properly installed photo eyes (black sensors), mounted no higher than 6 inches off the floor. 2. Block the photo eye with an object over 6 inches tall, and press the Garage Door Opener’s close button. The door should not close. 3. Lay an object that is at least 1.5 inches higher on the ground in the door’s path, and press the close button. The door should reverse off this object. You can easily check if your equipment is working correctly by using a few items you likely have in your garage. Starting August 1, 2018, updates to the UL 325 Safety Standard will require a minimum of two means of independent entrapment zone protection in both the open and close direction for slide gate operators to function. Manufacturers of gate operators and related entrapment protection devices work closely with Underwriters Laboratories and the Consumer Product Safety Commission to improve standards for entrapment protection. Safe gate systems are everyone’s responsibility. Ask your installer to follow UL 325 and ASTM F2200 safety standards to ensure your automated gate or gate system is safe. To be UL 325 compliant, two independent safety entrapment protection devices must be installed at each entrapment zone (inherent reversing system counts as one device). 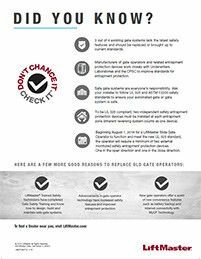 Beginning August 1, 2018, for a LiftMaster Slide Gate Operator to function and meet the new UL 325 Standard, the operator will require a minimum of two external monitored safety entrapment protection devices. One in the open direction and one in the close. LiftMaster® Trained Safety Dealers have completed Gate Safety Training and know how to design, build and maintain safe gate systems. Advancements in gate operator technology have increased safety features and improved entrapment protection. New gate operators offer a world of new convenience features such as Battery Backup and internet connectivity with myQ® Technology. We know that workplace safety is paramount to you. This is why we’ve implemented the UL 325 standard into our Commercial Door and Gate Operators. Our highly trained Authorized Dealers make sure you have the right equipment – installed properly – to ensure the safety of your employees and property. To ensure the safety of your employees and property, all our Commercial Door and Gate Operators meet the UL 325 standard for safety. All our Commercial Door and Gate Operators come equipped with the safety inputs to add the proper safety devices, but it is up to your installer to add the right entrapment protection for you. Our Authorized Dealers are trained to properly install our equipment, assuring you know it will safely work how it should, when it should. Make sure to clearly post warning signs on both sides of the gate and stay clear of the gate when its closing to prevent any injury or damage to vehicles. Don’t reach through a gate to operate its controls. To help prevent this, make sure the controls are at least 6’ away from the gate. Check to make sure you have properly installed safety devices like photo eyes or reversing edges at each entrapment point. Have a separate pedestrian access point so people do not have cross the path of a moving gate. In today’s world, security, safety, and convenience become more important than ever. As the industry’s largest manufacturer of garage door openers with over 40 years of experience, LiftMaster® knows what you want in a garage door opener. That’s why our feature package goes beyond the usual and expands into important expected and unexpected features. We believe that you will find that every garage door opener we manufacture will exceed your expectations. We offer exclusive features that you won’t find in other manufacturer’s garage door opener models. 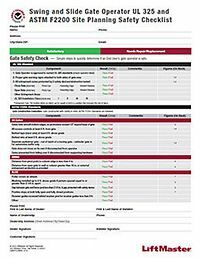 As a matter of fact, LiftMaster Garage Door Openers have created a whole new standard for the industry with the following security, safety, and convenience packages. To insure the highest degree of safety and customer satisfaction, we believe it is important that garage door openers manufactured prior to 1993 be replaced, as opposed to being repaired. To learn more about our position on pre-1993 openers, click here. To view our CPSIA compliance certificate, click here. We are committed to the highest standards of product safety. Over the years, the LiftMaster® brand has led the industry in introducing innovative product safety features. As a company, we have manufactured garage door openers for 50 years with a safety record that ranks as one of the best in the industry. In the early 1990s, the Consumer Products Safety Commission (CPSC) enacted into law new rules ensuring that all garage door openers manufactured after 1992 had external entrapment protection devices, such as infrared sensors or sensing edges, in addition to the internal contact reverse mechanism. Garage door openers made prior to 1993 are safe and reliable if installed, tested, and maintained properly. However, the vast majority of these older units are not equipped with infrared sensors or other external entrapment protection devices, and thus do not meet today’s standards for garage door opener safety. To insure the highest degree of safety and customer satisfaction, we believe it is important that pre-1993 garage door openers are replaced, as opposed to being repaired. In 2008, Chamberlain made the decision to stop supporting the repair of all pre-1993 LiftMaster garage door openers, this includes technical service support and the sale of replacement parts. We believe this decision will provide you with the latest in technology and more safety, security, and convenience features. Chamberlain will not be responsible for warranty or liabilities incurred as a result of someone repairing a pre-1993 (non-infrared or safety sensing) garage door opener. We believe this decision is in the best interest of our customers, as safety always comes first. To upgrade your unit to a newer model, please contact a LiftMaster dealer near you. On September 21, 2018, California Governor Jerry Brown signed Senate Bill 969 into law. This legislation requires newly sold or installed garage door openers in residential applications in California to have battery backup beginning July 1, 2019. California had its most destructive fire season in 2017 with widespread power outages that made it difficult and/or impossible for some to escape. When loss of electricity occurred, garage door opener operation was impacted and deaths were attributed to homeowners becoming trapped because they were unable to open their garage door manually. This law applies to new garage door and garage door opener installations in California residences. Homeowners will need to install a battery backup opener when a new door is installed or when they replace their existing opener. Existing openers currently in use will not need to be replaced with battery backup openers unless the door is being replaced. If it is time to replace your opener before July 1, 2019 we recommend replacing with a battery backup opener to ensure compliance with the new law. On or after July 1, 2019, no person, corporation, or entity shall manufacture for sale in California, sell, offer for sale at retail or wholesale, or install in California a residential automatic garage door opener that does not have a battery backup function that is designed to operate when activated because of an electrical outage. Failure to follow this will result in a civil penalty of $1,000 per opener installed and operational. Safety is our number one priority. In anticipation of this new law, LiftMaster is offering a comprehensive battery backup Garage Door lineup. All battery backup openers sold for installation in California include an integrated battery to ensure the full solution is installed in the garage. For Frequently Asked Questions (FAQs) on California SB-969, click here. To see what LiftMaster Garage Door Openers are already SB-969 compliant, click here. The State of California has not endorsed these or any other garage door openers.